to poetry, to book reviews. . . I was drawn to Evicted by my own circumstances. I had made friends with a poor family living about an hour away. We hosted their daughter’s 18th birthday party and invited her to live with us while she attended school. When they were losing their home through financial ignorance (they thought they could pay ahead and then stop paying for a while), I offered to sell them a property which I was preparing to rent—to sell it to them on land contract because they had bad credit: no bank accounts, no credit cards. In the back of my mind I carried the idea that everyone should be given the opportunity to own their own home. After all, isn’t that the American dream? What this family lacked in financial stability, they had in friendship. There was nothing they would not do to help me, going out of the way to find a part for one of my appliances, offering to mow my lawn, not asking for anything at all in return. I believed that I could give them the means to improve their lives financially, to learn how to make regular payments, to gain an asset, and ultimately to qualify for a bank loan. My assumptions were that someone acquiring ownership in a home would improve the home. I also assumed that a friend would make regular monthly payments and would follow through on everything they promised to do. Both of these assumptions proved false. After about 5 months, the payments stopped. I gave them more time—a few months and then confronted them. They told me about a work injury and hung their heads in shame. I gave them even more time and told them that I would not throw them out because of an unforeseen injury. Now, 20 missed payments later and a trashed house, I must do something, but how can I throw out a mother and three minor children? Even though I no longer trust the mother (who is now divorcing the father), what about the children who have not only lost the stability of a two-parent household but now might lose their friends, their teachers, their coaches, and their school? What might an eviction cost them? It sickened me to think of evicting these children whose birthdays I had celebrated, baseball performances I had cheered, and who had cut and colored my hair. Their mother cleaned my vacation rental in the area and their father performed carpentry and other work for me. I had an entanglement that is far more complex than the ordinary landlord/tenant relationship. The stress of my decision convinced me to read and review the book Evicted. Maybe it would give me a different perspective. Maybe it would help me understand people who seem so irresponsible and uncaring. Maybe it would help me find other options. The book was not as I expected from a major publisher. Cheap paper and large print do not create a pleasant reading experience. I only hope that the copy I have is not the final version. However as bad as the paper felt, I quickly forgot it when I encountered the real people within the book, landlords trying to make a living and provide for Milwaukee’s poor and tenants who take measures that seem reasonable only to themselves. This is an ethnography, a book relating a culture through the eyes of the people within it. EVICTED follows the stores of 2 landlords and several tenants in a poor section of Milwaukee, Wisconsin. One landlord, a former elementary school teacher buys distressed properties and with her husband fixes them well enough to rent to the poorest of the poor. She and her husband work full time on their properties and bring in about $10,000/month. When a tenant fell behind, she said, “I guess I got to stop feeling sorry for these people because nobody is feeling sorry for me. Last time I checked, the [county treasurer, loan officer, electric company] still wanted their money.” My feelings exactly. Doesn’t my tenant realize that I have bills to pay? The other landlord profiled in EVICTED owned a trailer park and had hired a manager and office helper to rent the trailers, handle repairs, and collect rents. This is not part of my experience and as I read about the drug dealers renting in the trailer park, it was as though I was peering into an alternate reality. I simply could not relate to someone whose only interest was achieving the highest return on his property with no concern for the quality of his tenants or his properties, or what extreme measures were taken to collect rent. Still, it was an education to see the lengths to which he went to get cash in hand from a defaulting tenant. The author rented from him and could not even get this landlord to supply him with hot water. That’s my definition of a slumlord. All of the tenants were low income, but shared little else in common. Most of them were desperate to provide for their children. Some of the tenants were on drugs; others would not touch drugs, and still others were recreational marijuana users. These were people who could not plan for the future, who simply spent each day trying to survive. Those who made paying rent a priority often had little left to live on, and found themselves scrimping on food, medications, and clothing. And the landlords? One had the time (and money) for week-long island vacations, but found herself scrimping the last week of the month—a week before the rents would roll in. Some landlords would not rent to people of color, people with children, or people who had even a single eviction on their record. Evicted shows us the landlord using self-help means to collect rent: knocking on doors the day welfare checks arrive, showing up at odd hours with hands out, asking for money, going to court and working out a settlement . . . or not, and then the sheriff and moving company walk in, empty the house of all items down to the ice cube trays, leaving a pile at the curb, or in storage where the tenants’ treasured belongings remain in rented storage space until redeemed, or more likely, until rent goes unpaid and the things are sold or discarded. Landlords get tired—tired of handling evictions, tired of fixing broken plumbing and appliances. Tired of physically knocking on doors to collect rent. Tired of tenants who make empty promises to pay in full when their income tax refund comes in, or from money borrowed from a tapped out relative, or when they receive their welfare check. These promises are recycled in various forms at various times by various tenants trying to stay in their homes. Landlords hear them at the eviction hearing where the tenants try one last time to convince the landlords to give them more time. The tenants are tired, too, and overwhelmed. Instead of fixing a constantly clogged kitchen sink, they just ignore it, throwing old clothes on the floor to soak up the overflow. They close the kitchen door and do dishes in the bathroom, until that sink clogs. The heat fails and they turn on stove burners. The toilet fails and they go in a bucket and empty it into the trash. The refrigerator fails and they live on McDonalds. When children’s services comes calling, they purchase cheap half-working appliances just to keep their children. Why do they do this? To avoid any contact with the landlord to whom they owe money. And no, this is not the heart of Appalachia, this is Milwaukee, Wisconsin a major metropolitan area. In Milwaukee, as in every American city, we see families forced to endure sub-standard housing, living in shelters, searching for the elusive “home.” This book isn’t even about home ownership, but about the ability to have a safe and stable housing situation. Ownership is too far away from many people to be even a glimmer in their minds, but a safe and stable living situation is their desired goal. They scramble to find rent by begging, borrowing, and stealing, selling drugs, and even their own bodies. The author allows us to peer into their world and see “solutions” that are not working and the desperate search for housing. I had never considered the author’s idea, statistically supported, that neighborhoods have a life of their own which can be fragile. We in the “burbs” enfold ourselves in subdivisions where houses and yards look similar and we have our “standards.” But inner city neighborhoods are formed from people who have a common interest. When people remain in a neighborhood and get to know their neighbors, they can band together for the safety of their homes and children. One man in the book was struggling to raise his two teenage sons in a stable environment. He was a double amputee but was unable to obtain Social Security disability payments. He survived on welfare payments, with next to nothing left over after his rent payment. Despite his circumstances, his place was where the neighborhood teenagers would come to hang out in safety, play cards, and talk about growing up. He was a stabilizing influence on his block. When people are shunted in and out of a neighborhood through eviction (or foreclosure) the neighborhoods become unstable and unsafe. Drug users and sellers move in, gangs are formed, and crimes increase. Stable neighborhoods, where people can move in and out freely and are not evicted or otherwise forced out of their homes, are safer and make the entire community safer. The author believes that decent housing should be a basic right afforded to all people for the common good. The current system is broken. That’s clear. No one can survive in northern winters and no one should have to survive without a safe place to lay their heads. Landlords cannot give away rental property. They should and must make money from their investments. And tenants are not all the same. Some will treat property well and even improve its value. Others will allow their children to run wild, tattooing hardwood doors and trim with ball point pens, tearing doors from their hinges, smashing holes in the drywall. Discouraged tenants live in squalor and disgruntled landlords give up performing more than make-do repairs and just go after the money. The solution offered by the author, vouchers or rent subsidies, does not currently work because landlords can and do raise the rent above what is customary in the locale simply because the voucher authority sets high rent caps. In many cases, access to vouchers are limited—many poor cannot get them and the program sets standards for the housing which might exceed a landlord’s improvement budget, especially in older homes. The author’s solution would require universal vouchers for every family below a certain income level, less onerous requirements for landlords to accept the vouchers, and a demand that all landlords accept vouchers. But who will fund this? It’s been successful in England and the Netherlands, but those are small countries. Is some legislator in the United States willing to try? Or could there be a better solution? Something must be done. I’m almost persuaded to leave the rental market due to the stress of broken relationships and a trashed property that I put so much time, energy, and money into making beautiful and up to code. On the other hand, my erstwhile friend and her three children need a safe place to stay. Maybe the electric companies have the right solution. The poor can pay drastically lower utility bills through a program that gives them an incentive to make regular on-time payments. For each payment (at about 10% of income), the remainder of what they would owe each month is forgiven and they have a percentage of their payment applied to past debt. But how many of the poor keep up the utility payments? The utility company has an out. They can turn off their service. Landlords’ only recourse is to convince a defaulting tenant to move or to evict them. And there is no evidence that the utilities have success with their program. If someone will not pay rent for more than a few months, perhaps they will also stop paying for their utilities. Maybe we landlords can come up with something better for tenants who fall behind. I don’t know what that may be, but private solutions are often better than ones provided by the state. Just look at public housing. This book was provided to me free for an unbiased review. I received this book from Blogging for Books for this review. We hope that you enjoy this Interview: B.J. Robinson and we'd like to thank Pamela Cable King for sharing her interview with us. I am delighted to have Author B.J. Robinson here on the blog today for an interview, B.J. is the author of several novels including her latest civil war era romance – Azalea Plantation. 1.) When did you decide to become a writer? In other words, what made you actually sit down and write something? I wrote a story in the third grade about my pet dog, and it was published in the local newspaper. After that, I wrote poems and played at writing songs. In college, my first essay was published in another local newspaper, and I won first prize in fiction-writing competition. My short story was published in the university’s literary magazine. That influenced me to write more and confirmed for me that I could. 2.) Every writer is eventually asked this question, but where do your ideas come from? Life. Family. Friends. News. Music. Nature. Scripture. Experience. Vacations. Travel. Reading other books. Why do you write what you do? I enjoy writing romantic suspense because it combines romance and mystery. I read every Nancy Drew mystery I could get my hands on as a young girl and loved mysteries. I also enjoy writing historical romance because it combines romance and history, and I love the antebellum era. 3.) Do you work to an outline or plot or do you prefer to see where an idea takes you? I never outline. I like writing by the seat of my pants and seeing where an idea takes me, but I do have a vague plot in my head when I begin. I might write a couple of paragraphs about my characters and setting and their main conflict and go from there. How do you think you’ve evolved creatively? I am experiencing with using a storyboard though I have not used one before. I’m trying the process on my WIP. Though writers never arrive and are always evolving, I have broadened into research with my historical romance novels, and I use more details. I enjoy books with multiple viewpoints because I find them more interesting and deeper, and those are the ones I like to write. When I look back at my older writing, I can see how far I’ve come. 4.) What is the hardest thing about the creative process of writing? I don’t find the creative process of writing hard in itself because I love to write, but there are times just getting started is hard. I don’t mean starting the first chapter, but just sitting down and starting. There are times I can find a million other things I need to do instead of write. I have to make myself get started and once I do, the writing usually flows. If you’re a Christian, what are the challenges you believe Christian writers face now and in the future? I couldn’t write a book and leave God out of it. Yes, I’m a Christian. I believe Christians face the greatest challenge of hooking a reader in the beginning because so many won’t give a Christian book a chance unless they’re other Christians. The world is turned off to our books and many will not buy them because they’re a Christian book, so they don’t even give your book or your writing a chance. Readers may not read enough of a novel to give it a fair chance or may shut the book and not read it at all. If you would, please tell us what was the hardest thing about writing your last book? The hardest thing was making the timing work with the plot and that can be the tricky part of writing historical fiction. I can sit and just write a contemporary or a romantic suspense novel and spin one out, but it takes longer to write historical ones. How long does it typically take you to finish your books? It depends on the type of book. If I am writing contemporary or romantic suspense, and I make myself focus and write every single day, I can complete one of about 50,000 words in a month. If I’m writing a historical novel, I have to research and make the timing and plot work so it takes longer, but I can write one in a couple of months taking my time. If I push myself, I can write one in about six weeks, but I don’t usually do that. 5.) Name your three biggest frustrations about the writing business. One is not being able to submit a manuscript without an agent since my writing has improved. Years ago, you could, but back then my writing wasn’t what it is now, and publishers no longer accept manuscripts without an agent. Two, getting an agent can be as hard as finding a publisher. I no longer worry about that since Amazon opened the doors, and I self publish. I did have four novels published by a small publisher before I went into self-publishing, and I learned so much from that experience and from editing them again after an editor had sent back my changes. I also learned from being in a critique group. Three, marketing and advertising are the hardest parts, and I could write more if I didn’t have to spend so much time on those areas, but when you self-publish, you have to do it all. Even authors published with publishers have to. 6.) On the flip side, what excites you the most about the creative process? I love being able to just cast out all worries, sit down, and let the words flow as they may, using a spiral notebook and blue medium-point pen. That’s when I am really creative. I don’t seem to be as creative sitting in front of the computer and keying in words. So, I might take to the notebook a bit in the middle of a novel to spice it up. That is when I really have fun writing, when I can just sit down and write. 7.) What are you reading at the moment, and who are a few of your favorite authors and why? Pamela King Cable, you’re one of my favorite authors because of your southern writing. I loved Southern Fried Women. Televenge was awesome, and I can’t wait for The Sanctum. Readers are in for a real treat with it. I love the way you take a person back and make them feel like they’re in that time and place, and I love southern writing. Chris Fabry’s writing attracted me with his novel Dogwood. I’ve enjoyed Eva Marie Everson’s work because she also writes southern fiction. Naomi Musch writes books using nature, and she’s a wonderful writer. Stephenia H. McGee writes historical romances I’ve enjoyed. There are really too many to name them all, and I have an iPad full of great books I haven’t even had the time to get to. I keep buying them because I’m a reader as well as a writer, and I usually take some time off between books and read. I am reading The Sanctum as soon as I can get it on my iPad. I’ve read Rita Geralch’s After the Rain, and really enjoyed it. I’ve read Sid Frost’s series about a mobile library and loved them. One of the most recent ones I’ve read and really enjoyed because of the writing style was The Badge and the Bible by Terry Burns. I’ve been busy writing my own series and have been reading Christian nonfiction lately and reading research. I am not in the middle of a novel at this time, but I am waiting for Stephenia H. McGee’s new historical and The Sanctum to come out so I can read them. 8.) If you would like and have the time, write a paragraph or two about anything you wish. I'd like to thank Pamela King Cable for sharing her interview with us. 1. When did you decide to become a writer? In other words, what made you actually sit down and write something? A: As soon as I learned to read and began to devour books, I started to dream of becoming a writer. I even decided I would write under another name, and I chose the name Pam Black, because I thought mine was too difficult for people to remember. Now, I love my slightly unconventional name, but I did include Pam Black as a minor character in one of my novels. I finally decided to put pen to paper (or to open up my laptop) when my husband retired from a long-time pastorate. Since I wasn’t as involved in his ministry, I found I could finally indulge my love of writing. 2. Every writer is eventually asked this question, but where do your ideas come from? Why do you write what you do? A: The idea for my series, Titus Ray Thrillers, and the first book in the series, One Night in Tehran, came after I heard about the persecution of Christians in Iran about five years ago. Because I’ve always been an avid reader of mysteries and thrillers, I knew my first book would be in this genre. However, when I heard about the Iranian Christians, I began asking several questions, which eventually became the plotline of the book. I wondered what would happen if a veteran CIA intelligence operative in Tehran encountered a group of Iranian Christians and became a believer. How would his conversion affect his career? How would a man trained to lie and deceive others be able to follow the teachings of Christ in the real world? My series developed around this character and the plotlines have expanded because of asking these questions. 3. Do you work to an outline or plot or do you prefer to see where an idea takes you? How do you think you’ve evolved creatively? A: I’m not a plotter; I’m more of a pantser. That is, even though I have an idea of where I want the book to take me, I don’t make an outline, except for writing down a paragraph or two. In other words, I “fly by the seat of my pants.” Mine are suspense novels, and I like to be kept in suspense. Creatively, I believe I’ve evolved by being able to envision my characters without the necessity of searching for images of potential characters on Google, something I did in my first book. 4. What is the hardest thing about the creative process of writing? If you’re a Christian, what are the challenges you believe Christian writers face now and in the future? If you would, please tell us what was hardest thing about writing your last book? How long does it typically take you to finish your book? A: The hardest part of the creative process of writing is knowing how much information the reader should be given in order to be able to stay interested in the plot. There’s a fine line between too much information and too little. That was the hardest part of writing my last book, Two Days in Caracas. This probably comes from enjoying the research aspect of writing. For example, while I found out some fascinating information about the features available on a yacht, I wasn’t sure my readers would feel the same way. Christian writers always face the challenge of how much of the gospel message to include. I always try to keep in mind I’m writing an espionage thriller and not another book of the Bible. All three of my books have taken me a year to write, because I’m an incessant editor. 5. Name your three biggest frustrations about the writing business. A: My three biggest frustrations about the business of writing is the need for constant promotion, the amount of money needed for promotion, and the time it takes away from writing to do promotion. 6. On the flip side, what excites you the most about the creative process? A: By far the most exciting part of the creative process is character creation. I love seeing how my characters interact with each other, what comes out about their backgrounds, and how the story simply emerges from their personalities. 7. What are you reading at the moment, and who are a few of your favorite authors and why? A: Although I don’t have much time for reading while I’m in the middle of writing, I try to read at least one fiction book and one non-fiction book. My present fiction book is Radiant Angel by Nelson DeMille and my non-fiction is J. I. Packer’s book, Knowing God. Naturally, my favorite authors are in the mystery/thriller genre and include, Daniel Silva, Lee Child, Harlan Coben, James Patterson, and Nelson DeMille. There are dozens more, of course. A: One Night in Tehran introduces veteran CIA intelligence officer, Titus Ray, who, after being hidden away in Tehran for three months by a group of Iranian Christians, returns to the States determined to explore the life of faith he saw exhibited by these dedicated believers. Back in the States and forced to go on medical leave, Titus learns he’s been targeted by Hezbollah assassin, Ahmed Al-Amin. Now, while trying to figure out what it means to be a follower of Christ, he must decide if the Iranian couple he meets in Norman, Oklahoma has ties to the assassin, and if Nikki Saxon, a local detective, can be trusted with his secrets. You can view theBook Trailer here. 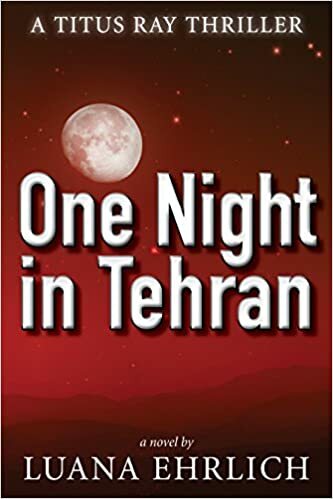 Purchase One Night in Tehran here in either print, Kindle or audio book format. 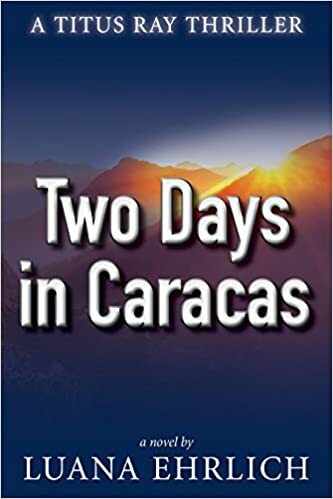 Two Days in Caracas, the second book in the Titus Ray Thriller series, follows Titus as he travels from Costa Rica to Caracas in an effort to stop Ahmed Al-Amin from assassinating a high-profile government official. Along the way, a family crisis jeopardizes his mission, and an Agency employee threatens to destroy his career. As the danger mounts, he’s forced to partner with an untested operative to complete the mission and bring Ahmed to justice. You can view the Book Trailer here. Purchase Two Days in Caracas here in either print, Kindle or audio book format. Three Weeks in Washington will be published in mid-June 2016. This third book in the series has Titus racing across two continents in an attempt to prevent a chemical weapons attack on Washington, D.C. Then, in a strange twist of events, he jeopardizes his own career at the Agency by exposing an Iranian deep-cover operative, who has close ties to the Washington elite. About.Me10. Tell us a little about yourself. A: I grew up as a preacher’s kid, and, although it may surprise some people, it was actually my dad who gave me my first spy novel when I was eleven years old. After that, I was hooked on the thriller/suspense/mystery genre forever. I’m also a news fanatic, and I follow events around the world on a daily basis, particularly the Middle East. I married a minister, and we’ve lived in several states in the South and Midwest and have served as missionaries in Costa Rica and Venezuela. For the past two decades, we’ve lived in Norman, Oklahoma, where my husband has been the senior minister at a Baptist church. For the past several years, I’ve been writing for Baptist Press, a national news service for Baptists, where I’ve written stories about the experiences of newly converted Christians. And, in a similar fashion, when we lived in Indiana, I wrote a weekly column for The Indiana Baptist, which told the stories of ordinary people who became followers of Christ and was entitled, “A Story To Tell.” I belong to several organizations for writers, including the American Christian Fiction Writers. I am blessed to be the mother of a beautiful daughter and grandmother of two outstanding grandsons, who live in the Norman area.